We have assembled a list of products that may be helpful for dogs with weakness, especially rear leg weakness. These products may be available through your local pet supply store, various internet sources, or your regular veterinarian’s office. We think they will facilitate the lifestyle of both the dog and the owner. The products pictured here are only examples, and are not all-inclusive. Other companies make the same type of products, and many of the companies included here make other products, as well. 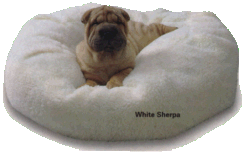 For example, HandicappedPets.com offers many of these and other products for disabled dogs. Standard legal disclaimer: Although we or our clients may have used some of the products on this page, most are here only because someone told us, we saw their advertising, or we ran across their web page. We can’t vouch for any of these products or their companies, but if something looks like it may be helpful for your pet, please contact the company directly and find out for yourself. Conversely, if you know of any helpful products for arthritic dogs that you think we should include on this page, please eMail us by clicking on the “Send eMail” link at the very bottom frame of the page, and tell us the appropriate information to include in the future. Slippery floors are trouble for the weak dog. Many a dog can exhaust himself trying to rise on a hard wood or tile floor. Rubber shoes for dogs have been used to protect the paws of performance and rescue dogs. They also help for negotiating slippery floors. Some dogs simply need help getting up and we don’t all have the strength to keep dog-lifting several times a day. Fortunately, special handle-harnesses are available to assist in raising up the back or front of the patient, whichever end needs help. When the food and water bowls are located on the floor, it may be hard for a dog to lean down to reach them. The dog may not be able to steadily bend his elbows and knees slightly so as to reach the food without becoming weak and having to lie down. And then it may be all the more difficult to stand up again. 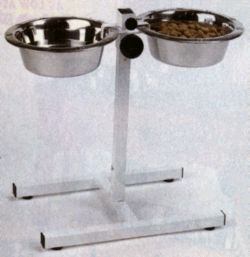 Providing raised bowls allows the dog to maintain a standing position and be able to reach the food and water. Your veterinarian can order this product for you through PetEdge (formerly known as the New England Serum Company). PetEdge does not sell directly to pet owners. Comes in Small, Medium, Large and X-Large, but the biggest two sizes may not fit inside your home washing machine. Do you know of a helpful product that we haven’t mentioned? Please use the “eMail us” function below to let us know.